A team from Lawrence Technological University was the winner in the integration category of a national student design competition sponsored by the Architectural Engineering Institute (AEI) of the American Society of Civil Engineers. The Charles Pankow Foundation Annual Architectural Engineering Student Design Competition was held at the AEI’s annual student conference in Philadelphia on March 29. It attracts the top students from the country’s leading architectural engineering programs. Members of LTU’s team that took first place in the main category of the Pankow architectural engineering compeititon are (L-R in the back row) Kevin Lambert, Breanne May, Zachary Lahrman, Michael Paciero, Michael McMurphy. In the front are Rachel LaCasse, Francesca Montana, Elizabeth Ozzello and Timothy Truitt. Lawrence Tech took first place in integration, the only required category in the competition. The team also earned two runner-up awards in the optional categories of mechanical design and electrical design. This year’s challenge was to address the design, integration and construction issues for a high-rise office building in San Francisco. Focusing on the integration of the engineered systems for a high-performance building, students worked in multidisciplinary teams to integrate the engineered systems with building architecture while emphasizing sustainable design. The competition encourages collaboration, research, innovation, and peer review. “The student teams did an extraordinary job highlighting the important role of architectural engineering in the industry as a whole. Using critical thinking and creativity, the students demonstrated the bright future this specialty has in the profession,” said Kenna Chapin, chair of the ASCE Charles Pankow Foundation Annual Architectural Engineering Student Design Competition. The Pankow competition calls into play many of the practices that students have studied in LTU’s five-year master’s degree program in architectural engineering, which has an architectural design core along with the engineering curriculum. This multidisciplinary approach places emphasis on optimizing building design through the integration of engineered systems. Lawrence Tech’s program is one of about two dozen in the country. The members of the winning team were Rachel LaCasse, Zachary Lahrman, Kevin Lambert, Breanne May, Michael McMurphy, Francesca Montana, Elizabeth Ozzello, Michael Paciero, and Timothy Truitt. The nine students are in the first cohort of the LTU program and expect to receive their master’s degrees in May. Almost all of the students already have full-time or part-time jobs in the field. 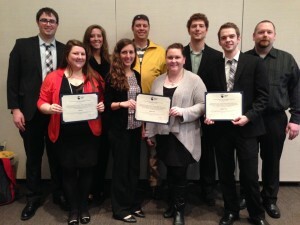 The LTU students entered the Pankow competition as their master’s degree capstone project. They set up three-person teams to focus on the electrical, structural, and mechanical parts of the design process. Through an intense collaborative effort, all team members contributed toward the winning entry in the integration category. Associate Professor Ralph Nelson of LTU’s College of Architecture and Design served as faculty lead for the team. He was assisted by Assistant Professors Daihong Yu and Mena Bebawy of LTU’s College of Engineering. Adjunct Professor Faris Habba was the team advisor for exploring emerging technologies and strategies in structural design for high-rise buildings, and several professionals from LTU’s architectural engineering industry advisory board provided critical feedback to the team throughout the project.